- A change in nosebands can make a bit much more effective; often you can avoid going to a stronger bit by changing the noseband. 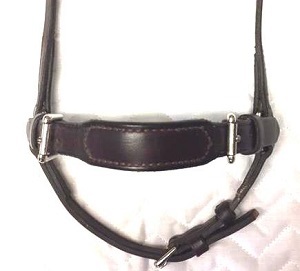 - Any problems with the teeth can make a noseband very painful. Make sure the teeth are checked regularly. 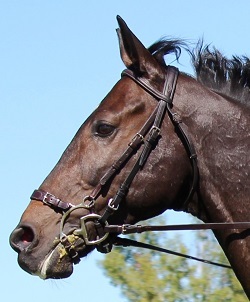 - Nosebands are not usually very effective in preventing a horse sticking its tongue out. 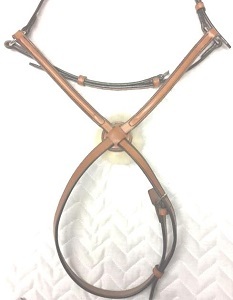 - Small changes in buckle placement can make a noseband more comfortable. It is not expensive to have small alterations done by a tack repair person. - Cheekpiece should lie below the line of the cheekbone. - Noseband should be about 1 1/2 - 2" below the end of the cheekbone and you should be able to fit 2 fingers inside the noseband when done up. 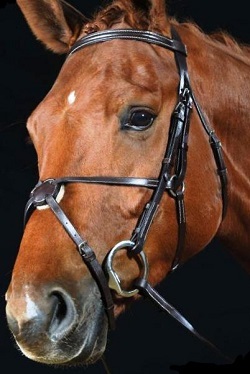 - Cavesson nosebands are not particularly effective at closing a horse's mouth and jaw. 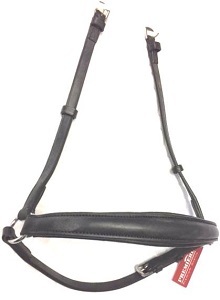 - Cavesson nosebands are available from Pony to Oversize in most colours and bridle styles, including padded, raised and fancy stitched. 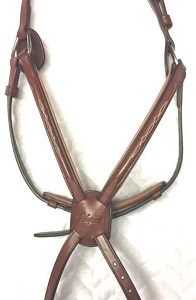 - A 'Crank' refers to a pulley system on the strap that goes under the jaw of the horse, that allows the noseband to be done up tightly enough to close the horse's mouth and jaw. 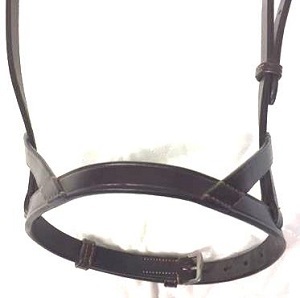 - May be part of a cavesson or flash noseband. 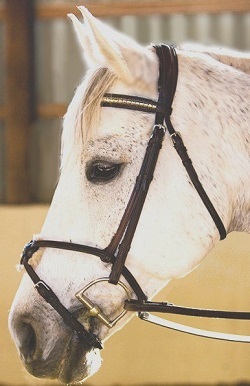 - Fit the noseband as usual. Care should be taken not to over-tighten the crank chinstrap. 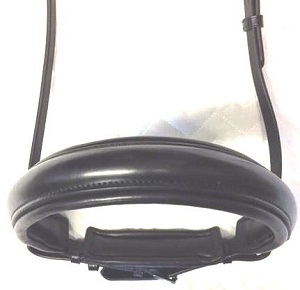 - Make sure the chin pad is long enough to fully protect the underside of the jaw. 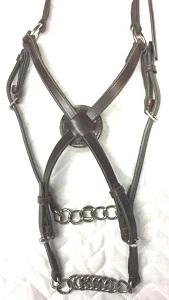 - Crank nosebands are seen most often in dressage either as part of a flash noseband or in a cavesson in a double bridle. Cranks should be well-padded and must not be over-tightened. 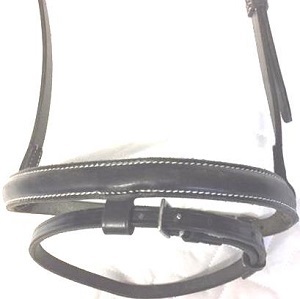 - Dressage type cavesson crank nosebands are usually available in black in Cob, Full and Oversize. 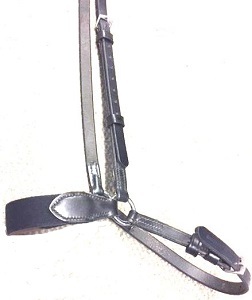 Flash cranks may be found in brown and black from Cob to Oversize in styles for dressage and jumping. - Most often seen in Dressage at the lower levels or on young horses. - Most simple method to close a horse's mouth. 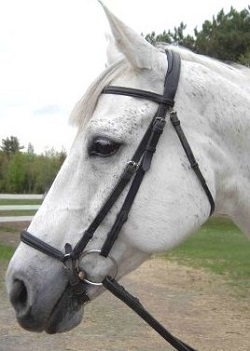 - The noseband sits lower than other nosebands but not below the end of the nasal bone. - The chinstrap is done up below the bit in the chin groove with room for at least a finger underneath. Make sure the buckle does not lie where it will rub sensitive skin. 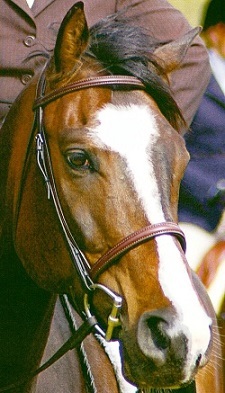 - Drop nosebands are the simplest noseband to close the horse's mouth and jaw. It is important that the top strap sits well above the nostrils so it doesn't impede breathing. 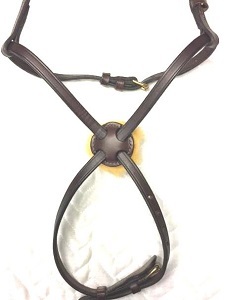 - Drop nosebands are available in Cob and Full in black and brown, including padded, raised and with extra buckle adjustments on the nose part. 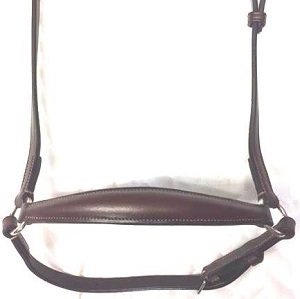 - Very popular in dressage, eventing and on jumpers. - Combines a cavesson with a drop strap that fastens below the bit to close the jaw. 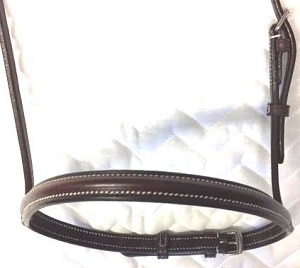 - Noseband should be about 1 1/2 - 2" below the end of the cheekbone and fastened snugly to avoid it being pulled down when the drop strap is done up. - The chinstrap is done up below the bit in the chin groove. Make sure the buckle does not lie where it will rub sensitive skin. - Flash nosebands can be quite effective at keeping the mouth and jaw shut, but it is important to ensure they do not rub and they are not over-tightened. 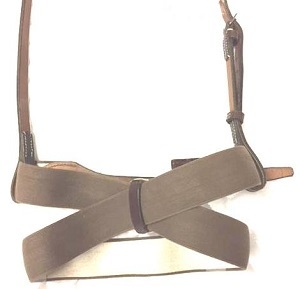 The drop strap may attach to the cavesson in several ways; it may run through a loop or a D-ring or a slot on the noseband, and one style may fit better than another. - Flash nosebands are available in Cob, Full and Oversize in black and brown, including padded, raised, fancy stitched and crank models. 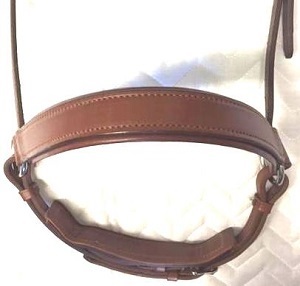 - Most popular in eventing and on jumpers. - Fitting high on the nose, figure 8s hold the jaw closed in two places with minimal impact on breathing. - The 'ring-cheek' figure 8 has one strap that is fit high on the cheeks, with the other fitting below the bit. Care should be taken that the ring doesn't sit on the cheekbone and that the cheekpiece doesn't lie too close to the eye. If the cheekpiece of the figure 8 lies underneath or below the cheekpiece to the bit, it's usually safe. - The top strap of the 'sliding cheek' figure 8 is normally fit just below the cheekbones, again with the lower strap fitting below the bit. - Ring cheek figure 8s are a little easier to fit, but care should be taken to avoid putting pressure on the prominent cheekbones with the rings. - Sliding cheek figure 8s are totally adjustable, but a bit fiddly as they need to be re-set each time they are put on. 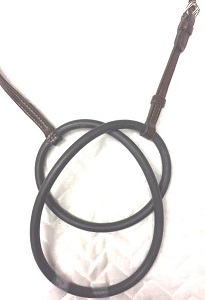 - Figure 8 nosebands are available in Pony, Cob and Full in black and brown, including padded, raised, and fancy stitched models. - Most often seen in eventing and on jumpers. - Helps prevent the horse from crossing its jaws and getting strong. 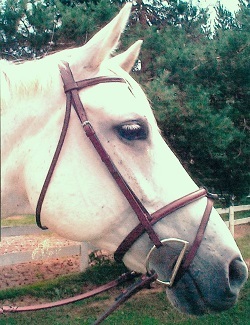 - Noseband should lie across the nasal bone; the exact placing will depend on the size of the metal side pieces. 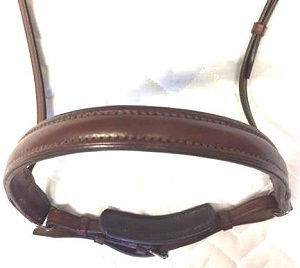 - Neither the strap running under the jaw nor the one below the bit need to be tightly fastened to be effective. 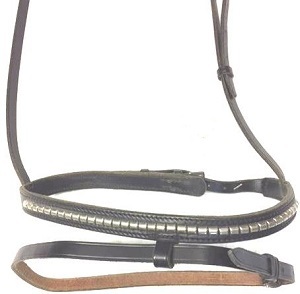 - These nosebands can be quite effective at keeping the mouth closed and preventing the horse from crossing the jaws. - Works well on horses who are sensitive to the bit but get strong. 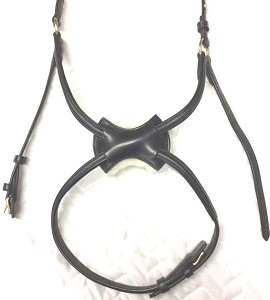 - This noseband will often increase the effectiveness of the bit significantly. 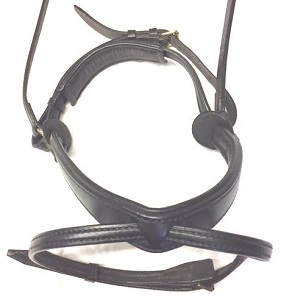 - Crescent nosebands are available in Cob and Full in black and brown; some with extra buckle adjustments on the noseband. 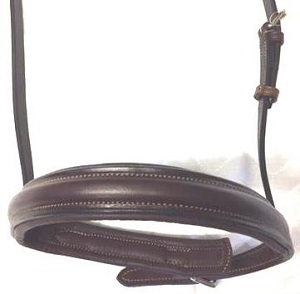 - Most often seen on strong horses in eventing and show jumping. 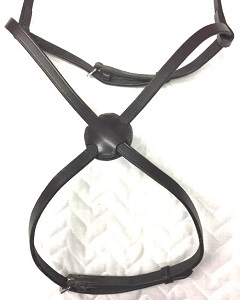 - Can reduce the pressure of the bit on the tongue and bars and instead puts pressure on the nose when there is tension on the reins. 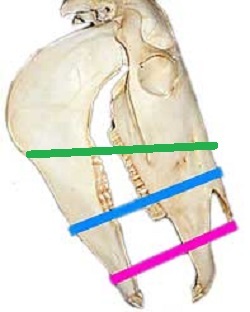 - Noseband should lie across the nasal bone; the exact placing will depend on the length of the horse's mouth and where the bit lies. 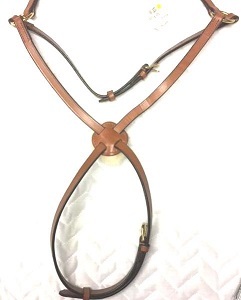 The noseband needs to be short enough that the bit 'sits' in the loops. - The loops fit underneath the bit rings, preventing the bit from being pulled against the tongue and bars. 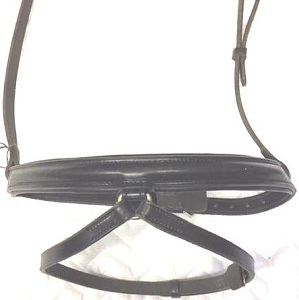 - These nosebands can be quite effective as the nose pressure can make more of an impression on some horses than bit pressure. 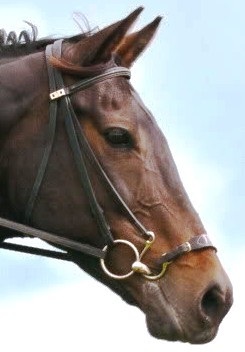 - Note that the Kineton does not actually close the horse's mouth at all. 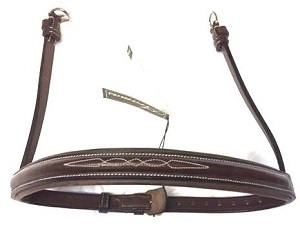 - Kineton nosebands are available in Cob and Full in black and brown; some with extra buckle adjustments on the noseband.